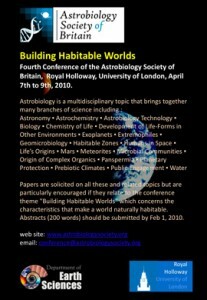 The fourth Astrobiology Society of Britain conference, ASB4, was hosted this year at Royal Holloway, University of London, over 7–9 April 2010. The conference was a huge success, attracting well over 50 delegates, both nationally and internationally, and demonstrated the incredibly broad range and diversity of current astrobiology research. The meeting also attracted a number of journalists and TV documentary producers and so will hopefully make an appreciable impact in presenting astrobiology within the public eye. The papers proceeding from this meeting have now been published in a special issue of the International Journal of Astrobiology. The reference for this special issue is International Journal of Astrobiology 9(4). A pdf of the abstract booklet, listing all oral and poster presentations, is also available for download here.